This new rod development showcase SENSES Development Team determination to bring exceptional style to the new generation sport fishing, leading Malaysia fishing tackle industry towards a new high. This new model will debut very soon! Currently, Blackhell will only be available in casting specs. The new rod will feature Fuji Alconite K guides, Fuji ACS reel seat, high grade EVA split grip. Blackhell are thoughtfully fitted with the blank construction as the focal point.  Blackhell utilise Japan's Toray 36Ton advance carbon cloth and Japan's Toray special 4 axis carbon cloth, with the half section of the blank constructed with axis ±45° woven carbon mixed cloth, easy to understand given that the fused a special 4-axis material called super quattro cross. The Super Quattro cross process using Toray special 4-axis material, it is intended that the extremely tight carbon muscle fibers vertical, horizontal, diagonal two directions to increased dramatically in all directions strength of blanks dressed in 4-axis direction. For Malaysia brand, this new blank is a major breakthrough from the previous model. Utilising Japanese high grade Toray carbon cloth, extreme light weight is achieve without sacrificing quality. 4 models between weight control only 99g ~ 110g, with any type of reel to achieve light weight and balance. BlackHell has sensitivity and the physical basis of torque and toughness. And has good casting performance. BLACKHELL will bring you into another realm!